An astronaut and a rock singer recorded an original song together and released it today (Feb. 8) as the first duet of new music performed simultaneously in space and on the ground. 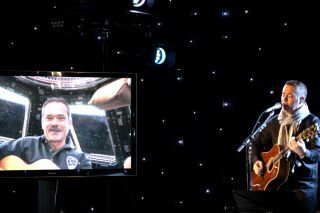 Chris Hadfield performed his portion of I.S.S. ("Is Somebody Singing") from the International Space Station's cupola.